Anthony Davis can become a free agent at the end of the 2019-20 season and one of the most sought-after players in NBA history. 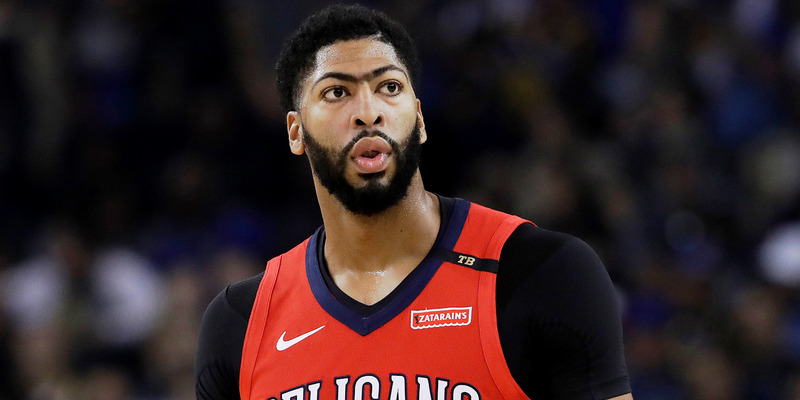 While his free agency is over a year away, there is already buzz about whether Davis will stay with the New Orleans Pelicans, in part because the team isn’t close to contending for a championship. Davis can sign a max extension at the end of this season, and if he doesn’t, teams may get aggressive in trying to trade for him before he hits free agency. Teams like the Boston Celtics, Los Angeles Lakers, and Golden State Warriors are considered suitors right now, but the list would expand if teams think Davis is gone from New Orleans. Anthony Davis has the chance to become the NBA’s biggest free agent since LeBron James in 2010 and Kevin Durant in 2014. The 25-year-old New Orleans Pelicans big man has ascended among the elite NBA players, putting up eye-popping nightly figures over the past five years while becoming a perennial All-Star. Nothing has changed for Davis this year, as he’s averaging 25 points on 49% shooting, 45% from three, with 13 rebounds, 5 assists, 2 steals, and 3 blocks per game for the 4-4 Pelicans. While Davis‘ contract doesn’t expire until after the 2019-20 season, chatter has started about where he could land. That’s in part because Davis could be in line for the „super-max“ contract extension this summer, and it’s unclear if he’ll take it to commit to the Pelicans. If he doesn’t, the Pelicans may need to begin shopping him, as he could hit free agency and walk. While Davis hasn’t given any indications that he wants to leave New Orleans, there have been signs that may concern the Pelicans. Davis recently told Yahoo’s Chris Haynes, for instance, that for the Pelicans to win, he has to be nearly perfect. In a league of super-teams, it’s not a great sign when a player feels he has to do it all to keep his team competitive. Likewise, this season, Davis signed with Klutch, the agency that represents LeBron James and is run by James‘ childhood friend Rich Paul. James‘ Los Angeles Lakers will have cap space this summer and are expected to pursue star players aggressively. Davis told Haynes that he knew the move would naturally draw speculation. Most importantly, the basketball fit might force Davis to move on. The Pelicans have made the playoffs just twice in Davis‘ career, with last year being the first time they advanced past the first round. Though sweeping the Portland Trail Blazers was an accomplishment, they looked far inferior to the Golden State Warriors, who Davis says the Pelicans are now chasing. But the Pelicans have few paths to improve. They’re unlikely to land a top draft pick to add talent to play alongside Davis, and they may have a tough time creating the cap space to land another star in free agency. Players like Jrue Holiday, Nikola Mirotic, and Julius Randle who surround Davis now are good players who keep the Pelicans in the playoff race, but realistically, they’re not enough to compete for a championship. Davis will be 27 at the end of the 2019-20 season. If he is still with the Pelicans and they haven’t made major moves to contend for a championship, he may decide to take his talents to a bigger market and a better team. The question is where that might be. The Boston Celtics are a frequently mentioned destination because they’re close to championship contention and have the assets to trade for Davis. The Lakers are in a somewhat similar position. Haynes reported that teams like the New York Knicks and Los Angeles Clippers would also monitor the situation in New Orleans. The biggest curveball of all will be if the Warriors get involved. It may sound like overkill for the three-time champions to add a player of Davis‘ caliber, but it’s not out of the picture. The Athletic has reported that the Warriors have their eyes on Davis, mainly if Kevin Durant looks likely to leave the team. Davis is the type of game-changing star who could extend their title run as their main stars age into their 30s. It’s rare for true superstars to hit free agency in their prime, with a real chance at moving elsewhere. When James and Durant hit the market, half the league volleyed for their services. Davis‘ free agency is well over a year away, but the buzz will only increase the longer his future in New Orleans stays uncertain.